I've seen a lot of FFA2 quilts and I'm so jealous of all of them...I need to jump onto the band wagon and buy some, some on payday! The quilts looks just lovely, prefect for a little a girl! Oh.My.Goodness. That really is beyond words. I love it! ohhhh I love it!!! Go you!! I love this, so very striking!! That is so cute. I really admire your work, everything you come up with is just outstanding from the layout you pick to the colors you put together. I hate that I can't be as good as you. I love htraditional pieced quilts and I love how you make them look so fresh and modern. Love love LOVE. This is my favorite use of this fabric line so far. This is simply magnificent! I love this!!! Such a simple pattern, yet so beautiful. Love your fabric. Love & blessings from NC! So incredibly genius. This is so pretty I want to cry! UH-MAY-ZING!!!!! I love love love it! I can' wait to spend money to get the FFA2 line! I agree that this is my favorite quilt using this line. I just received fat quarters of all Kaffe's dots. I'm such a happy camper. Now maybe I need to buy some FFA2 to go along with them? Amazing! I can't wait to see the finished product! 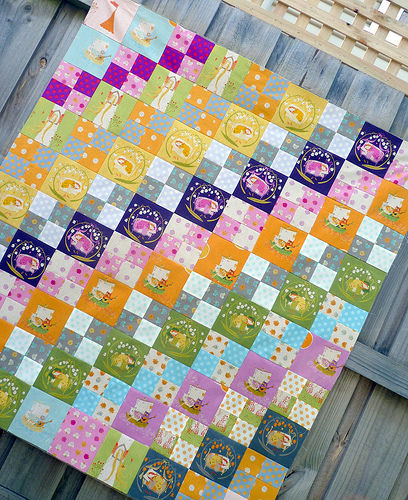 I am SWOONING over your fussy cuts and how beautifully they have come together! I just received the same fabric and immediately had a similar idea to yours. The fabrics so naturally separate into two different designs and the larger prints you want to show off but yours is the best I've seen. I might have to copy it and give it to a friend. Of course I'd give you credit but I won't sell it but I might use the pattern again in the future for similar fabric designs. You did the perfect pattern for the collection. Outstanding! Wow I absolutely love this quilt! I have loved the Heather Ross fabrics and I think it is so cool how you took the main points of the fabrics and used them as whole squares. oh. my. gosh. I totally love it. This is one of my favorites! Just gorgeous....thanks for such a pretty WW!! I think this is my most favourite yet Rita. Oh how I love this quilt. This is just gorgeous. I wasn't partial to FFA2 until I saw this! Well done, Rita, and thanks so much for sharing. Really lovely, can't wait for my fabric bundle to arrive! Thank you for showing that. Ohhh! I love this pattern! I LOVE THIS! What a way to start the day. Thank you for this bit of inspiration! You rock - that is AWESOME!! What a way to show off those prints - I love it! wow! This is a gorgeous quilt top! this is beautiful and exactly what i would have done for this line of fabric. well, in regards to the fussy cutting, that is. Wow is right, I have been carefully turning away everytime I see a FFA2 quilt but now I will have to go order. it´s so beautiful ... i like it very much. Gorgeous. Absolutely gorgeous! I just sat here for a few moments, sighing and feeling inspired. I love the fussy-cutting you have done, and the piecing is beyond perfect. Thank you for sharing your immense talent and hard work - I love seeing it! What an eye you have for what to do with various fabrics. Fuss cutting for this line is certainly the way to showcase it. Great job. Oh my gosh, Rita! Oh my gosh! How do you take such a simple concept and make it so beautiful. You are blessed to have the time and resources to make such use of your talent. Well! That's just darling. So crisp! OH! WOW! I am wordless (read speechless)! I like the way the fussy cutting leads your eye around the quilt. Heart palpitations - no, really! Me too (to all the above comments)....it's simply amazing Rita - absolutely gorgeous! !